Anesthetic Free Dental…What It Really Means For Your Pet. We’re sure many of you have heard of “anesthetic free dental cleaning” for your pets. They are often marketed as convenient as they can be done in your own home or at your local pet store. These procedures are often performed by members of the public that have declared themselves a title such as a “veterinary hygienist”. They are inexpensive and are done without anesthesia – sounds great right? Think again! Did you know that anyone who provides veterinary dentistry services in Ontario without the direction and supervision of a veterinarian will be considered to be practicing veterinary medicine without a licence? It is an offence for anyone who is not a licensed veterinarian to use a term, title, or description that may lead a member of the public to believe otherwise (ex veterinary hygienist, pet hygienist etc.). So what is the danger you ask? Unfortunately, anesthetic free dentistry (AFD) brings with it other risks and leaves many (if not most) patients to suffer silently from unrecognized dental disease. Owners think they received a valuable service, when in fact they and their pets benefited very little. This picture and dental x-rays are from a dog that had received regular non-professional teeth cleaning without anesthesia for many years. When the dog started to have difficulty eating her food the owner suspected that there might be problems that had not been detected. The dog needed close to 2 dozen teeth extracted because of advanced, severe periodontal disease. This is a prime example of how non-professional teeth scaling can allow severe dental problems to go untreated, leaving the patient in pain. We see many patients with similar stories. Note that the teeth appear “clean” and none were mobile or loose. Figure 1. A periodontal probe is placed into an area of severe bone loss. The patient had recently had AFD performed and the teeth appear to be clean. None of these teeth were mobile. Figure 2. Dental radiograph of the area pictured above. These teeth had minimal or no mobility despite loss of most of the supporting bone. The patient has been in pain for years. Fig. 3 – Dental radiograph of the same patient, showing large areas of bone loss and multiple abscessed molars that had been missed during the recent AFD cleaning procedure. Changes like these take years to occur. When humans receive a dental cleaning, we give total cooperation to the hygienist for around an hour. 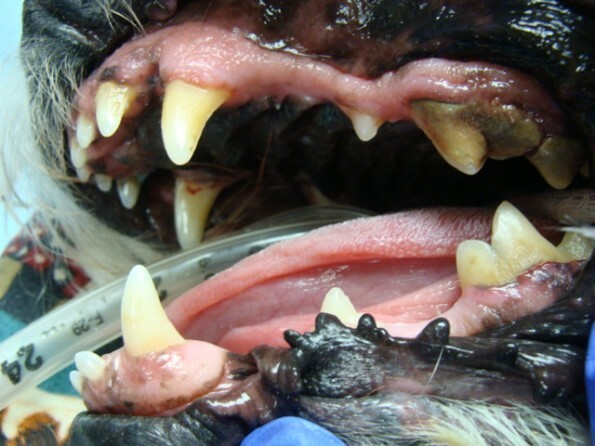 Veterinary patients have much more severe dental disease than the average human patient. Does anyone really believe that a dog or cat, with substantially more disease and oral pain than the average human, will cooperate adequately to enable a good cleaning? Really? AFD services commonly state that they will refer patients if they find pathology requiring any treatment. Unfortunately, they do not even know what they are missing, and about the only thing they might be able to evaluate is whether a tooth is mobile. By the time a tooth is mobile it has usually been decayed and painful for years. Professional dental cleaning includes scaling the crowns of the teeth both above and below the gum margin and polishing all scaled surfaces. Scaling is accomplished using ultrasonic power scalers and metal hand instruments that are kept extremely sharp. Calculus accumulation above the gum line has little adverse effect on a pet’s health. Conversely, plaque and debris under the gumline may have a profound effect on a pet’s health. Anesthesia-free dentistry (AFD) can provide improvement in the appearance of the teeth due to the removal of visible calculus. This may give a pet owner the misimpression that a professional periodontal cleaning has been performed. However, without subgingival treatment, periodontal disease has not been addressed. Removing just the visible calculus from teeth, without addressing the area under the gumline, is just “tooth grooming” since it makes the teeth appear clean while providing minimal health benefit. The use of general anesthesia is extremely safe when properly administered by trained individuals. Without general anesthesia, calculus and debris that pose a risk of aspiration since an endotracheal (breathing) tube with a properly fitting cuff is not in place. Power or hand scalers may contact the patient’s gums causing flinching or discomfort that may cause the pet to fear ongoing home hygiene measures. Physical restraint to force a painful procedure on a pet may induce fear of oral manipulations in the pet, cause physical injury to the pet or operator and results in substandard procedure. General anesthesia allows full oral examination with no patient jaw tone, objection, struggling, or anxiety. It allows tooth scaling without causing discomfort to the patient. It allows positive control, and protection, of the patient’s airway preventing aspiration of gross or aerosolized debris and bacteria. In short, it allows the operator to perform a complete and meticulous procedure. As a profession, we are committed to patient health and safety. Given the advantages provided by the use of general anesthesia (improved patient safety, better experience for the patient, ability to perform a detailed and meticulous oral examination, ability to take dental x rays and much better quality of the actual cleaning) and the fact that AFD provides only the advantage of being cheap, the College of Veterinarians of Ontario consensus opinion is that professional dental cleaning must be performed with the patient maintained under general anesthesia. Written by Suzanne Lyons, D.V.M Practice Owner Bloor Animal Hospital. 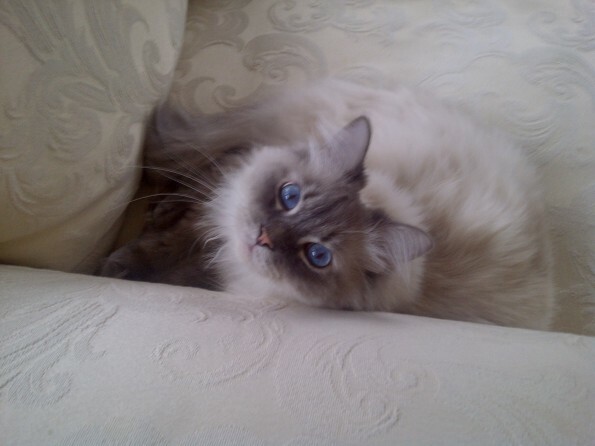 Our cat Max is a four year old Ragdoll with a wonderful gentle easy going personality-and what a looker! He has beautiful blue eyes and a beautiful silky coat. A couple of years ago we started noticing that Max had really bad breath. His teeth looked like an older cat’s teeth rather than that of a four year old’s. My mother didn’t really think anything of it and thought that was just the way he was. About six months ago Max’s left eye was dripping brown discharge and even though my mom would wipe it with a warm cloth and water it wasn’t going away and seemed to be bothering him. I work as a co-op student at Bloor Animal Hospital and made my mom take Max in for a check up. It turns out that Max’s teeth were severely decaying and rotting. He had stage 3 Periodontal disease, pockets between the teeth and the gums, gingival recession and more than 50% bone loss. Unusual for such a young cat! This was probably genetic and just the “cards that he was dealt” in life. We felt so bad for him! When Dr Lyons examined him and showed us his mouth his teeth in the back were bleeding! His breath was extremely bad. He must have been living with a gnawing pain and aching mouth and couldn’t tell us! On November 14th Max had to have 10 teeth extracted-one of them being his top canine. His remaining teeth were cleaned and are healthy at this time. He was given wonderful loving care and lots of medication for pain to make his recovery as comfortable as possible. Bloor Animal Hospital made certain that his pain was managed. After just a few of weeks we noticed that Max became almost like a kitten again! Running around playing and bouncing off of the walls. No more bad breath-just nice healthy pink gums! He eats soft food and even still enjoys small amounts of kibble. Max’s quality of life has greatly improved-he’s beautiful, healthy and happy! 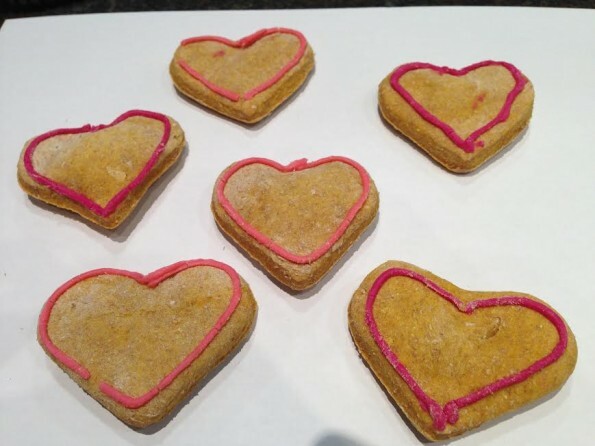 Tiffani & Katie made these tasty dog treats for Valentines Day! Here’s the recipe so you can make some for that special pooch in your heart, or come by the clinic this weekend and bring some home for that lucky dog! Combine water, mashed bananas, honey, vanilla, and egg in a large bowl. Stir in whole-wheat flour and baking powder. Beat dough with an electric mixer on medium speed until ingredients are thoroughly combined, 1 to 2 minutes. Turn dough onto a floured surface and knead until no longer sticky, 5 to 8 minutes. Bake in preheated oven until cookies are lightly browned, about 20 minutes. Turn off the oven and leave cookies until thoroughly dry and crisp, 30 to 40 more minutes. Remove baking sheets from oven and allow cookies to cool on pans for 10 minutes. Transfer cookies to wire rack to fully cool. Preheat oven to 350 degrees F (175 degrees C). Prick sweet potato several times with a fork. Heat sweet potato in a microwave on high until tender, about 6 minutes. Cut potato in half and scoop flesh out of the skin into a bowl; discard skin. Mash potato with a fork or potato masher and transfer about 1 cup to a large bowl. Save any remaining sweet potato for another use. Mix whole wheat flour, applesauce, and eggs in the large bowl with the sweet potato until a dough forms. Turn dough out on a well-floured surface and roll dough to about 1/2-inch thick. Cut out shapes using a cookie cutter or cut dough into strips with a pizza cutter. Arrange cookies on an ungreased baking sheet. Bake until crisp, 35 to 45 minutes. Cool in the pans for 10 minutes before removing to cool completely on a wire rack. flour (see note)Note: You will need approximately 3 Tbsp. of flour. You can use any type of flour for this recipe. Keep in mind that if you use wheat flour (or another type of flour with specs of color) it may affect the end color of the icing. Mix first three ingredients in a bowl until smooth. Mix in one tablespoon of flour at a time until you have a good consistency for spreading. Time for your Pet to Visit the Dentist? Before you go in, have a smell! Bad breath is the first indicator that your pet may have some dental disease. broken or fractured teeth and loose teeth. If you notice any of the above a trip to your veterinarian is the next step. An examination is key to evaluating dental disease. From there your veterinarian will discuss your options. 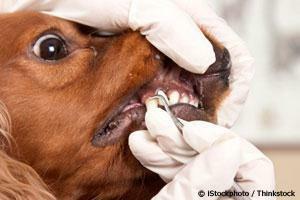 Depending on the level of your pets’ dental disease your vet may recommend a dental cleaning. Now that you know your pet needs a dental cleaning, what does that mean? Your pet will require a general anesthetic for the procedure (it is impossible to provide adequate dental care without it). The procedure is very similar to the cleaning humans receive. The Registered Technician cleans and polishes the teeth on the surface and below the gum line. Ideally dental x-rays of each tooth are taken. This is to ensure there is no disease under the gum line. The veterinarian will examine each tooth, checking for pockets or gaps between the tooth and the gums where bacteria will hide and cause disease. If there are any teeth that are diseased the veterinarian may freeze the area and remove the tooth. Once the procedure is complete your pet is woken up, recovered and able to go home later that evening. Good oral care is imperative for your pet to live a long and healthy life. If left untreated, dental disease can damage your pet’s internal organs, be a source of chronic pain and affect their quality of life. If you are concerned that your pet is suffering from dental disease or if you would like to learn more about your pet’s dental health, please discuss it with your veterinarian. We offer complimentary oral examinations with our Registered Veterinary Technicians for anyone who is interested in learning about pet oral care. Written by Ashley Kipling, Registered Veterinary Technician at Bloor Animal Hospital. 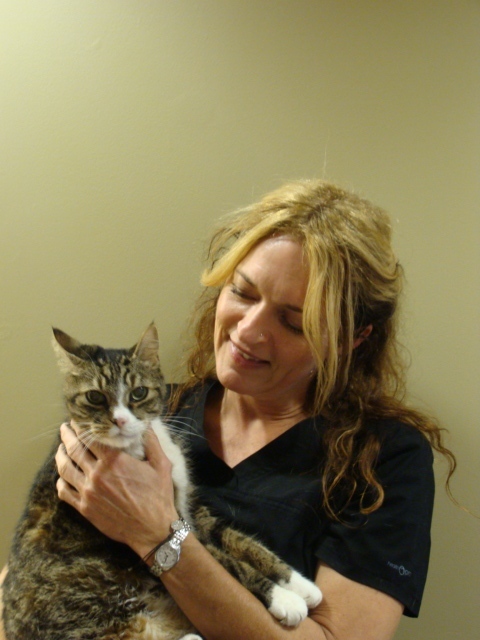 Speaking First Hand on Feline Dentistry – An Owner’s Perspective. Most recently I had both my cats in at Bloor Animal Hospital for dental procedures. I have had numerous, healthy cats over the years, all but one of them needing their teeth cleaned at one point in their lives, so I am well aware of how common and important it is to have your pets’ teeth cleaned. However, both of my current cats have unique issues that were of concern for me and I’d like to share this experience with you. Heidi: Heidi is my five (5) year old FIV positive kitty. FIV stands for Feline Immunodeficiency Virus which can make it more difficult for Heidi to fight off infections. Heidi was affectionate with those she knew, but could be a bit shy with those she did not. 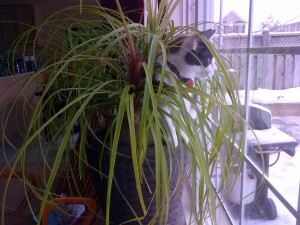 She liked to play for short periods of time and would then go hide for awhile. She rarely picked up toys in her mouth and did not play with toys for any extended period of time. I just considered Heidi a sweet but shy kitty. Heidi would always have runny eyes, a probable consequence of a herpes virus and/or related to having FIV. She rarely kept her face clean and disliked it when I would take a tissue to wipe the dark tears away from her face. For such a young cat, Heidi’s gums have been very red and sore looking, possibly due to her FIV positive status. I knew her teeth needed to be cleaned. Upon examination, it was determined that Heidi would need quite a few teeth out. I brought her into work with me so that Dr. Morris could perform her dentistry. Dental x-rays revealed that the roots of her teeth were mostly resorbed and that it was basically only her sore, red gums that were holding her teeth in. All her teeth had to be extracted except for three (3) canines in the front! I felt so bad for Heidi! What would she think when she woke up? Would she be depressed that she did not have any of her teeth anymore? She would only be able to eat canned food now. I wondered if she would miss crunching down on her kibble. Maybe she would feel like less of a cat without her shearing, carnassial teeth that made her the true feline carnivore that she was? What would an empty mouth full of gums feel like? And I wouldn’t be able to explain to her why she no longer had teeth or give her any forewarning that this was how she would wake up. I felt so bad for her! When Heidi came home, she was happy and rolling around, sometimes pawing at her mouth, but otherwise content. I attributed this behaviour to the long-acting pain killer that was given to her…good times! However, days turned into weeks and it was revealed that Heidi was a new cat..and not just the fact that she was a cat with only 3 canine teeth! She now spends her most of her time out and about socializing, playing with toys and with her people family. She keeps her face clean! She wipes away the tears on her face and I never have to do it for her! A revelation came to me, someone who thought she knew cats so well, especially her own: although I always thought Heidi was a happy cat, there was no doubt that her sore gums and teeth were hurting her and I had no idea just how much! All that time, she was not at her full happy capacity. Now that Heidi’s face wasn’t sore, she was happy to keep her face clean of tears. Now that Heidi wasn’t in pain, she was happy to be pet and played with, picking up toys in her mouth and tossing them around! And she is a-ok with canned food instead of dry….trust me! It makes me so happy to see Heidi such a changed cat! I only wish I had only done it sooner! 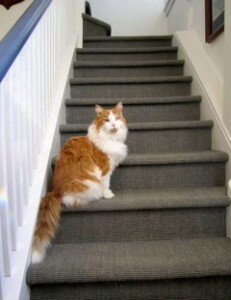 Keats: Keats is my fifteen (15) year old diabetic cat. Keats was diagnosed with diabetes in 2007 and has been receiving insulin injections twice a day since then. He had dental cleaning in 2011 with a few extractions. Diabetic cats tend to be more prone to infections which includes dental disease. Keats’ breath was getting increasingly bad and his teeth did not look good. A thorough examination confirmed that he would need his teeth cleaned with possible extractions. Preoperative bloodwork and urine testing revealed that, at Keats’ older age, he was beginning to show signs of kidney issues. Despite knowing firsthand the competency of the doctors and staff here at Bloor Animal Hospital and how often dental cleanings are performed on the young and old here, I was personally a bit nervous about putting my own 15 year old diabetic cat with kidney issues under anaesthetic. But I also knew that I have had cats that have lived to be 20 years old and if Keats was going to be one of those cats, he couldn’t do it with an infected, sore mouth. Not only was his mouth sore, but the bacteria and infection in his mouth was also aggravating his diabetic and kidney issues. Keats was started on IV fluids the night prior to his dentistry to prepare him and his ageing kidneys for the anaesthetic that was going to be used the next day during his dental procedure. Nine (9) extractions later (leaving only one lonely canine tooth in front! ), Keats was done! 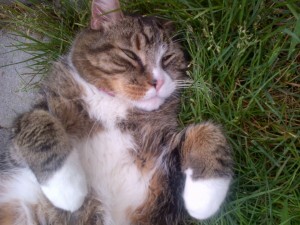 And, just like my experience with Heidi, Keats was a much happier cat! He is far more active and his eyes have that younger cat sparkle back in them! And now Keats will be much more likely to reach that ripe old age of 20…or maybe more…with a mouth which is free of pain and discomfort. Written by Kirsten, loving cat mom & Veterinary Receptionist at Bloor Animal Hospital. Sometimes It Takes a Village-Bloor West Village That Is! It was January 3rd when Simba, a handsome 13 year old cat first came through our doors. He was in the care of Diana and Gord Ross. 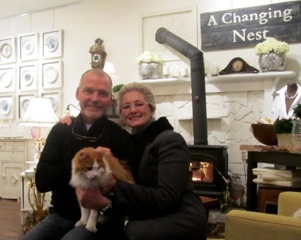 Diana is the owner of A Changing Nest home furnishing and consignment shop in Bloor West Village . About 6 months prior the Ross’ noticed Simba wandering the area around the store. Day after day there he was, looking like he could use a meal and a place to stay. One day, Simba wandered in. Being natural animal lovers, the Ross’ welcomed him. Already having a number of other pets of their own, they were unable to bring Simba home, but the store seemed like a perfect fit for him. Simba took to his new home and immediately felt comfortable with his new family. He also was hired as the store’s “meet and greet”, welcoming customers and enjoying the attention and affection in return. Thanks to the love and care provided by the Ross’ he went from a street cat to a celebrity and became known by name by most customers and residents in the area. The day Simba first visited us, he was in to have an infected wound in his paw examined, but at this visit, a much greater concern was noted. Simba had glaucoma in his left eye. Glaucoma is a condition where there is an increase in pressure within the eye. It is painful and permanently damages the optic nerve, resulting in blindness. Unlike glaucoma in humans, dogs and cats respond very poorly to medical management and often need their eye removed to resolve the pain. We felt for the Ross’ now having to make some important and costly decisions for their new friend. Instantly, we could see why everyone had grown so attached to Simba; his bright orange coat, his kind and gentle personality and the head butts of course! We knew we had to help. The Ross’ had already done so much to care for Simba, on top of their other pets, yet Simba still had a painful condition that needed to be treated. We wanted to help this community cat! On January 9th, Dr. Lyons and the team at the Bloor Animal Hospital volunteered their time and resources to help Simba by surgically removing his painful and permanently blind eye. They also cleaned his teeth and removed a painful cavity. Simba sailed through his surgery without complication and made an excellent recovery at the hospital. He was a fabulous patient and bonded with the team immediately. Diana and Gord came to visit Simba frequently giving him love and affection to help him feel comfortable while at the hospital. Simba is now back at home at the store and doing better than ever! Now pain free, Diana is seeing him play with toys that he has had for 5 months now, but has never taken interested in! He is active and eating and back to working as the host of A changing nest. Clients and community residents alike are flocking to the store to see Simba back in full swing! Bloor animal hospital is proud to be part of such a fabulous community where we can work with other local business’ like A Changing Nest to help animals needing medical attention. Sometimes it really does take a village….